Last week i finally received my Sonia Kashuk brushes from Space NK after waiting over a week for them to come. You have probably seen many posts on then as they have been quite popular with the eauty bloggers as Space NK had an amazing 70% sale on the Sonia Kashuk range and had a huge amount of brushes to choose from! I think that £5 postage was extortionate for standard delivery which took 8 days to receieve, and this cost more than most of the brushes cost me! So overall these brushes were amazing value, and with delivery cost £28. My definite favourite is the flat top brush, and i have been eyeing this up for quite a while. I think that it will be perfect for my MSF Natural although it is quite small. The foundation brush & contour brush are so much smaller than expected! So will take a little more getting used to! 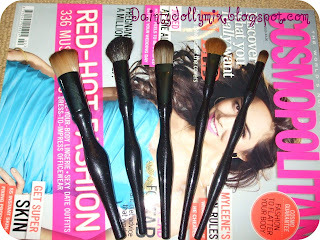 I love the designs of these brushes, think they are very sleek & professional brushes and will be good for every day use. Overall i am extremely happy, but will not be rushing to order from Space NK online again! Have you ever used Space NK online? What are your thoughts? I've just had mine delivered (took a week! )- my favourite so far is the flat top brush- so good for applying blush. Oh I'm glad you like the flat top, it's a fav of mine too!! ...Delivery was an JOKE! I will never order from Space NK again! Thats really bad about the postage! Grr.. hate it when that happens!!! I like Sonia Kashuk brushes. They're sold at Target here in the states. They're great quality and last a long time. I really like your blog by the way! These brushes look uber cute, I really want the bent eyeliner brush. I saw it in a youtube video and thought ooh gotta get it. Can't wait to see what you think of these brushes. so I thought it's worth mentioning. Prices seems a little high but include FREE UK delivery and the International rates are reasonable. So far this is the only option to get Sonia Kashuk outside USA i think.